The Aljunieds, who originated from Yemen and are descendants of the Prophet Mohammed, have been a prominent part of Singapore's civic and community life for more than 190 years. The family established themselves after 1819 as major traders and landowners who shared their wealth with the community. The family contributed to the building of the Masjid Omar Kampong Melaka off Havelock Road (Singapore's oldest mosque) as well as gave land for St Andrew's Cathedral and Tan Tock Seng's Pauper's Hospital. Syed Alwi's contributions were wide ranging and consisted of constructing wells at Selegie Road, Kampong Kisang, to provide fresh water to the public and paying for the consturction of bridges across Arab Street, Jalan Sultan and Bencoolen Street. Aljunied Road was named in 1926 following calls by Dr H.S. Moonshi (1895-1965), a Municipal Commissioner, for a major road to be named after the Aljunieds to honour their contributions to Singapore. There used to be an abattor located at the site of Blk 811 French Road and another near the site of the present Jalan Berseh Hawker Centre. Other industries in the area included a pineapple factory and the Sin Siong Lim Sawmill, the latter of which was established in 1912 by Dr Yin Suat Chuan, medical partner and brother-in-law of Dr Lim Boon Keng. Song Lin Building (1 Syed Alwi Road) now stands on the site of the former sawmill which was active until the 1960s. The shophouses were built in a range of architectural styles. Some are bedecked with colourful ceramic tiles while others feature elaborate Malay tracery patterns. 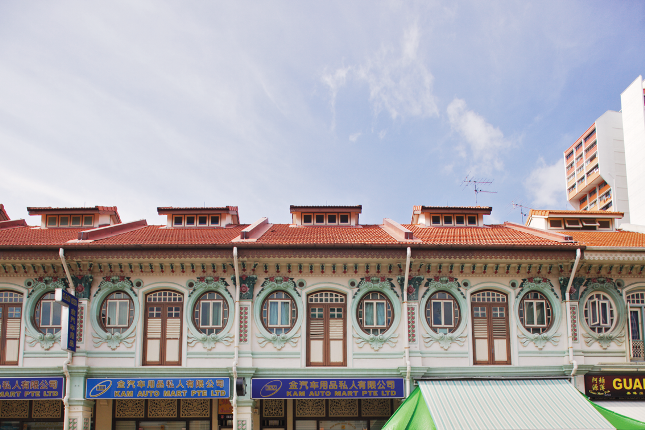 Neoclassical Corinthian and the elegant Rococo styles can be seen in the architecutral features of the shophouses.